Modern and cool, smooth and mellow - this collection is an ideal blend of material and style. The warm wood finish, paired with campaign-style hardware, with sturdy construction and clean lines makes this group a compliment to any décor. This collection contains Occasional, Bedroom, Media, and Casual Dining pieces. 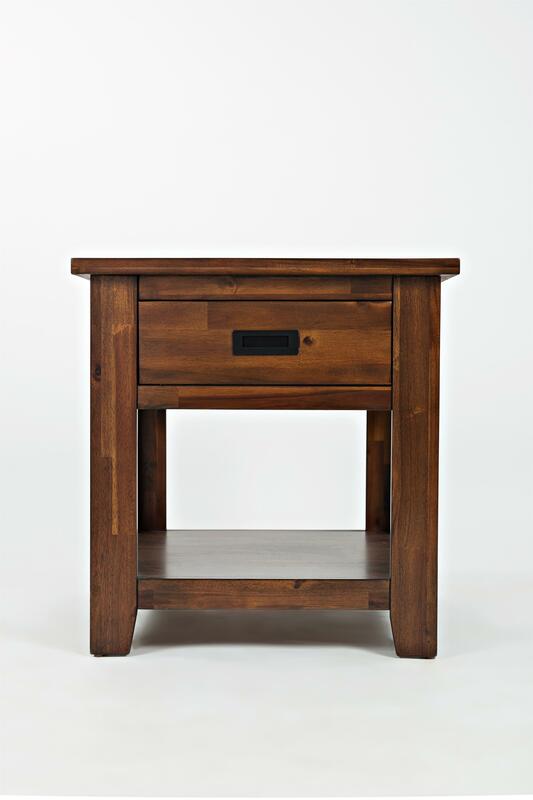 The Coolidge Corner End Table by Jofran at Zak's Home in the Tri-Cities, Johnson City, Tennessee area. Product availability may vary. Contact us for the most current availability on this product. Storage One Drawer: 14"W x 13.25"D x 3.5"H. One Shelf: 16"W x 17"D x 10"H.
Browse other items in the Coolidge Corner collection from Zak's Home in the Tri-Cities, Johnson City, Tennessee area.